hydromad is an R package (i.e. 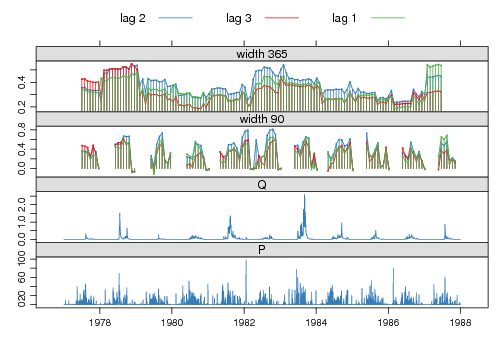 a software package for the R statistical computing environment). It provides a modelling framework for environmental hydrology: water balance accounting and flow routing in spatially aggregated catchments. 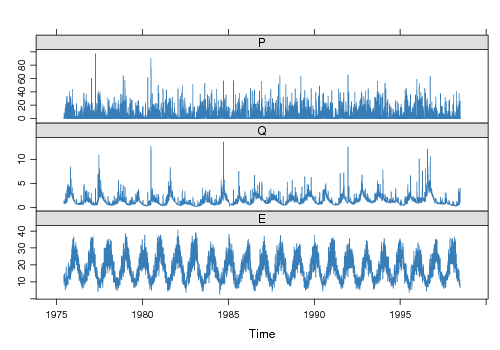 It supports simulation, estimation, assessment and visualisation of flow response to time series of rainfall and other drivers. 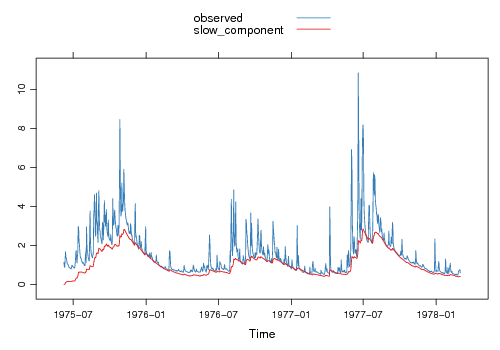 A minimal unit hydrograph framework is used, where areal rainfall is passed through a soil moisture accounting (SMA) model to estimate effective rainfall; this is then passed through a routing model to estimate streamflow. Included are several implementations of models consistent with this framework, notably the IHACRES CWI and CMD soil moisture accounting models, and unit hydrograph transfer functions for the routing. This site serves as a reference for the R functions and datasets in the package. 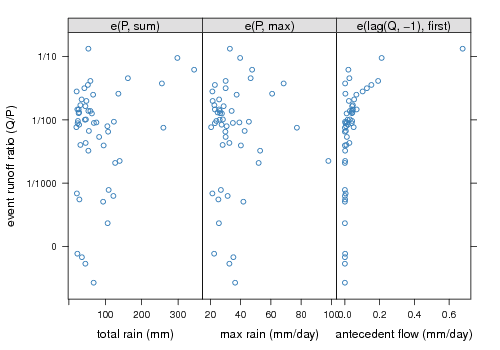 A gentler introduction can be found in the vignette hydromad tutorial and the paper An open software environment for hydrological model assessment and development (both included in the package). You can also look at the source code for the paper. The package is maintained by Joseph Guillaume. The modelling approach is based on work by Tony Jakeman and Barry Croke at The Australian National University. hydromad users group (questions and discussion). The hydromad package is currently not available from CRAN. Eventually it should be on CRAN but there are unresolved issues of incomplete documentation and references to the unreleased dream package. Install R if you do not have a recent version (the most recent release is recommended). To instead download the package manually see: Windows binary and source. Please direct questions and discussion to the hydromad users group. Specify rainfall - runoff (hydrology) models. Simulate hydromad models by parameter sampling. Calculate objective function value for a fitted model. 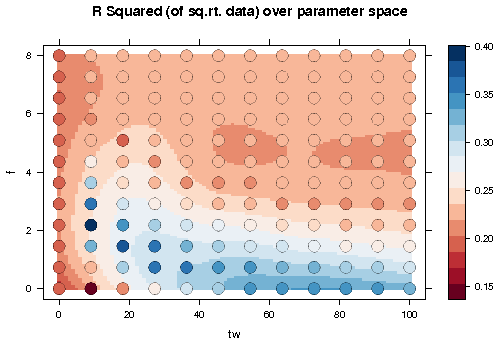 Fit a hydromad model by sampling the parameter space. Fit a hydromad model using general optimisation algorithms. 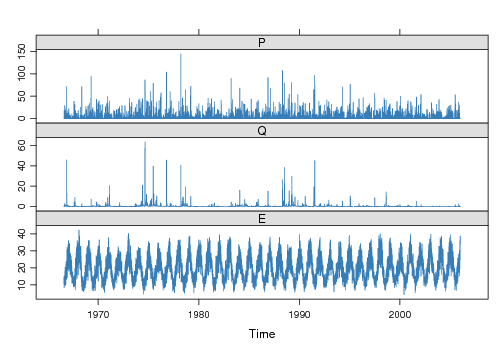 Fit a hydromad model using the SCE (Shuffled Complex Evolution) algorithm. 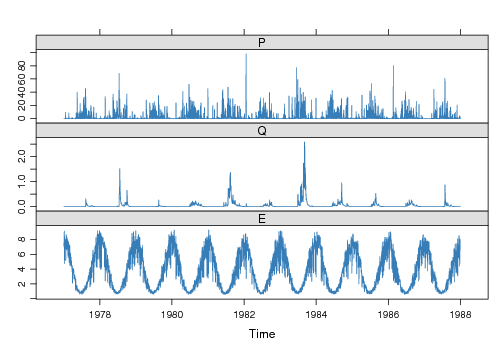 Fit a hydromad model using the DE (Differential Evolution) algorithm. 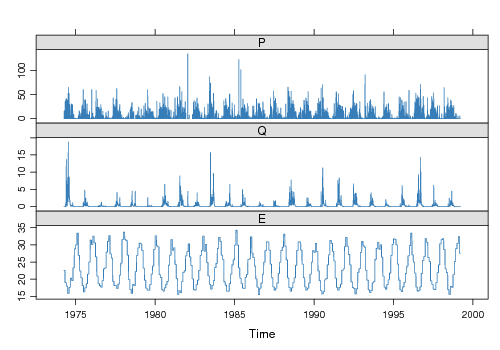 Fit a hydromad model using the DREAM (DiffeRential Evolution Adaptive Metropolis) algorithm. Fit a hydromad model using DDS (Dynamically Dimensioned Search) algorithm. Extract the feasible parameter sets meeting some criteria. 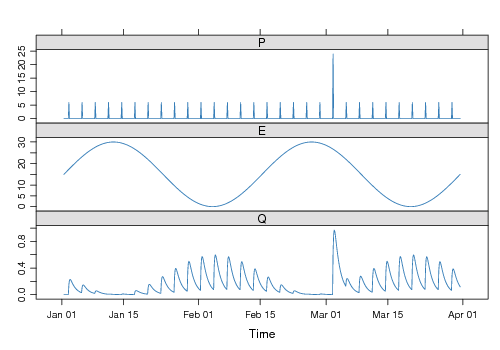 Identify discrete events from time series and apply functions to them. Typical initial model used in Data-Based Mechanistic modelling. 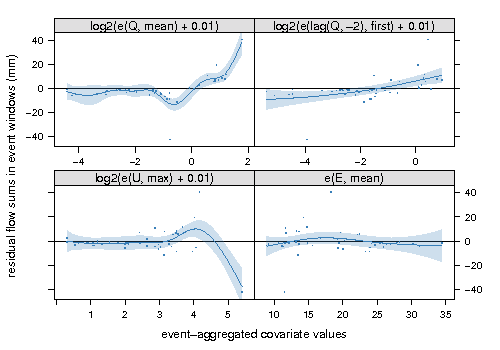 Estimate transfer function models by Least Squares. Estimate transfer function models by Simple Refined Instrumental Variables method. Estimate transfer function models by Inverse Filtering. 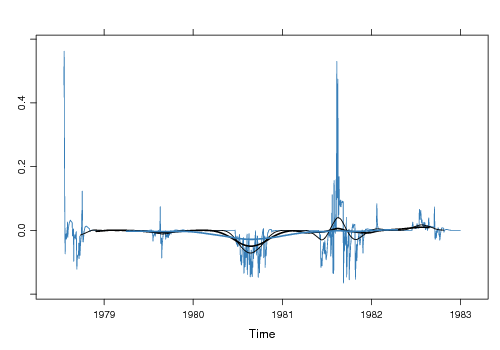 Invert transfer function models to estimate input series. Compare calibrations with different transfer function (ARMA) orders for routing. 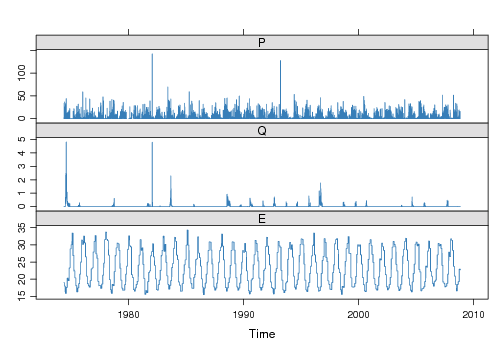 Rolling cross-correlation at given lags. Shuffled Complex Evolution (SCE) optimisation. 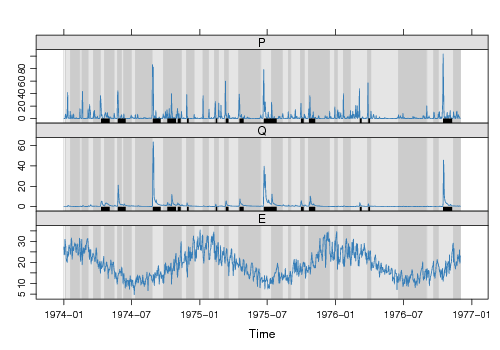 Rainfall and streamflow for Bingham River Trib at Ernies Catchment. 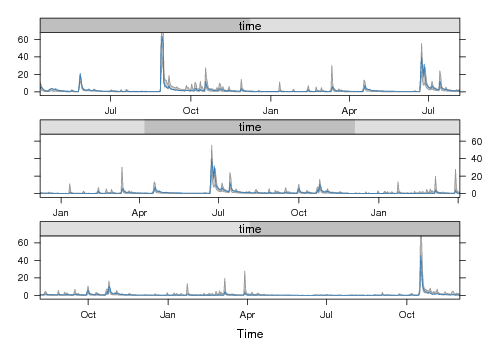 Rainfall, streamflow and potential evaporation data for Canning River at Scenic Drive. Rainfall and streamflow for Cotter River at Gingera. 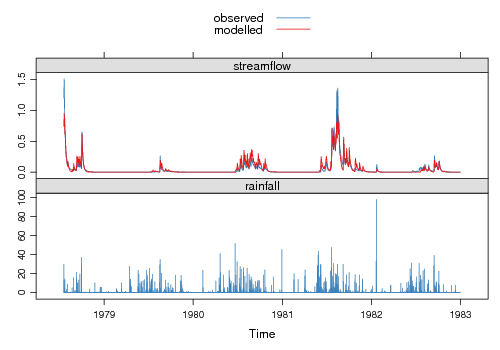 Rainfall and streamflow for Murrindindi River at Murrindindi above Colwells. Rainfall and streamflow for Queanbeyan River at Tinderry. Rainfall and streamflow for Salmon Brook at Salmon Catchment. Rainfall and streamflow for Wye at Cefn Brwyn. 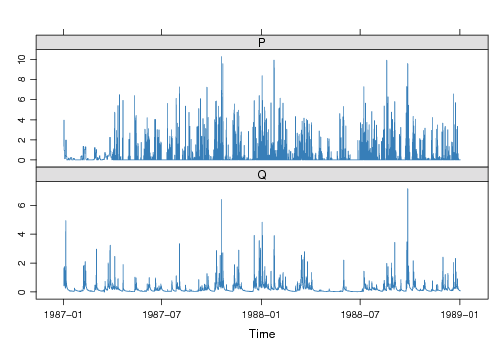 A simple simulated dataset for use in testing hydrological models. armax.inverse.fit Estimate transfer function models by Inverse Filtering. armax.inverse.sim Invert transfer function models to estimate input series. armax.ls.fit Estimate transfer function models by Least Squares. armax.sriv.fit Estimate transfer function models by Simple Refined Instrumental Variables method. BinghamTrib Rainfall and streamflow for Bingham River Trib at Ernies Catchment. Canning Rainfall, streamflow and potential evaporation data for Canning River at Scenic Drive. Cotter Rainfall and streamflow for Cotter River at Gingera. dbm Typical initial model used in Data-Based Mechanistic modelling. defineFeasibleSet Extract the feasible parameter sets meeting some criteria. 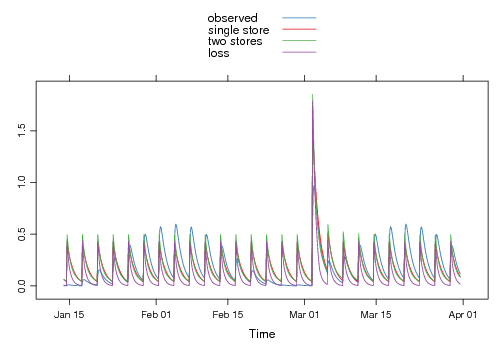 eventseq Identify discrete events from time series and apply functions to them. fitByDDS Fit a hydromad model using DDS (Dynamically Dimensioned Search) algorithm. fitByDE Fit a hydromad model using the DE (Differential Evolution) algorithm. fitByDream Fit a hydromad model using the DREAM (DiffeRential Evolution Adaptive Metropolis) algorithm. fitByOptim Fit a hydromad model using general optimisation algorithms. fitBySampling Fit a hydromad model by sampling the parameter space. fitBySCE Fit a hydromad model using the SCE (Shuffled Complex Evolution) algorithm. hydromad Specify rainfall - runoff (hydrology) models. 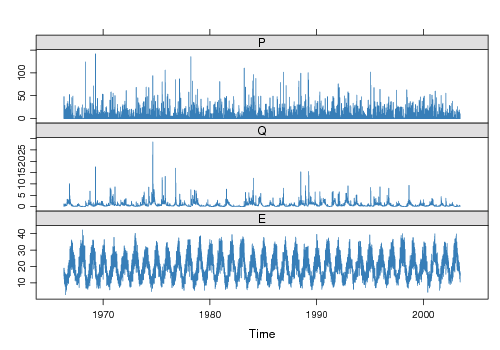 HydroTestData A simple simulated dataset for use in testing hydrological models. Murrindindi Rainfall and streamflow for Murrindindi River at Murrindindi above Colwells. objFunVal Calculate objective function value for a fitted model. Queanbeyan Rainfall and streamflow for Queanbeyan River at Tinderry. rollccf Rolling cross-correlation at given lags. SalmonBrook Rainfall and streamflow for Salmon Brook at Salmon Catchment. SCEoptim Shuffled Complex Evolution (SCE) optimisation. 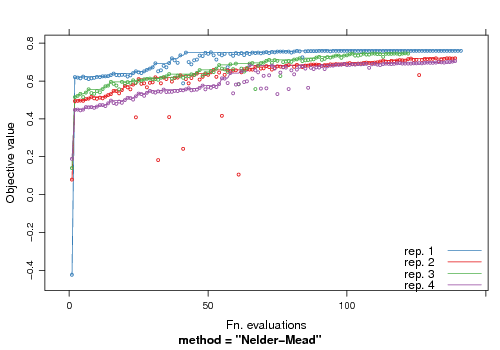 simulate Simulate hydromad models by parameter sampling. tryModelOrders Compare calibrations with different transfer function (ARMA) orders for routing. Wye Rainfall and streamflow for Wye at Cefn Brwyn.